The back cover of the book asks us a question, hinting towards the nature of the whole collection of stories: What tips someone over the edge to commit a crime? For a Nebraska farmer, the turning point comes when his wife threatens to sell off the family homestead. "I discovered something that night that most people never have to learn: murder is sin, murder is damnation (surely of one's own mind and spirit, even if the atheists are right and there is no afterlife), but murder is also work." The worst is never over, he goes on to say, the dead are never truly gone. Once Farmer Wilfred James convinced his son Henry "Hank" into becoming a willing participant in Arlette's murder, he changed the boy's life. The plan that sounded simple enough ended up more difficult than the pair could have imagined. A black spot in their lives that neither was able to fully wash off in the following years. As James narrates, eight years later, what happened in 1922, you see the extent of evil in people. Underneath all his guilt for what he did to himself and his son, past the fear of his wife's vengeful ghost, you still see that he blames his wife for what happened, that he believes his crime was justified, under the circumstances. He feels no real repentance. And the freakiest thing is, he knows it - he knows himself. 1922 shows you how thin the line between fantasy and reality is. It won't take long for your worst nightmare to come to life, for you to bring it to life and once that's done, it will take an eternity to put it back to sleep, if ever. On that ill fated night, Wilfred James raised something, the demon inside him perhaps, that tore at him and then ate away Hank's little boy innocence. "The Conniving Man" James calls him in his confession; the stranger inside every man. Even the pale little boy had evil lurking in him, which his father unleashed: clearly, when it took just a slap from Mama to make him want to help Poppa finish her off. But the truth came back to haunt the both of them. It hit Hank in the form of guilt, regret, overwhelming fear and perhaps confusion over his own actions and he dealt with it by blaming his father, rightly so. His escape with his girlfriend, from his father's farm, led to the bitter end that had already been written for him on that night in 1922. And the truth haunted Wilfred in a more literal sense: his dead wife's broken corpse accompanied him throughout his life, along with the army of rats nesting in her rotting body. Driven crazy by the ghosts of his past, now holed up in a hotel in Nebraska, Wilfred James writes a confession to his sins, documenting the whole truth as he sees it. "This is a ghost story, but the ghost was there even before the woman it belonged to died. 'All right, Poppa. We'll... we'll send her to Heaven.' Henry's face brightened at the thought. How hideous that seems to be now, especially when I think of how he finished up. 'It will be quick,' I said. Man and boy I've slit nine-score hogs' throats, and I thought it would be. But I was wrong." Like in every small town story he's written, King describes the setting in detail. The small town people and their small town talk and small town minds. A murder committed just because the farmer didn't want to move to the city. And then you realize it's not because of the setting. Take a twisted ego and put it anywhere and the story would play out in the same way. 1922 makes you sick and there is no redeeming glow of hope at the end. It is not a romanticized version of a killing. You end wishing you hadn't read the story and knowing you couldn't not have. There's little good in this novella but it's the ruthless honesty that we all need to take once in a while, chew on and swallow. The disintegration of Wilfred's mind, his gradual loss of sanity and his self inflicted justice form a lesson in morality like no other. Great review of this short story. I'll be curious to see what you think of Big Driver, as that was a REALLY hard story for me to read. booksaremything - Hey, thanks. Wait, that's the next story in the book. Now even I'm curious to see what it's all about! You are making me very keen on King, and he is on top of my list (after I finish Swann´s Way - if I eeeever do...). I haven't read this one yet, but I'm also reading for Kings March. I'm reading Insomnia, and I hope to finish it today! Where did you get the SK bookmark??? I love it! OMG, this sounds so chilling. I must try it some time. I haven't heard of this anthology. How many stories are there? Are all equally good? Nishita - It's a great book, definitely one of his strongest. There are five stories plus an extra in my book. 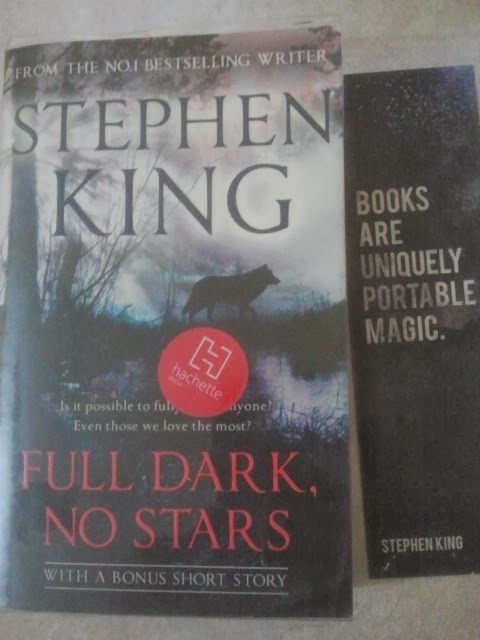 I've only read three so far, because they're really not the kind you can read in one sitting, they're scary, freaky and you need to make time to dwell on them. But basically, worth it. I do love King and I remember enjoying this book last summer. 1922 was really twisted. So, what'd you think of Big Driver?? That was the roughest one for me to stomach out of the whole book. I totally agree with your comment to Nishita, you really can't just read them in one sitting! I know that I'm a little late to the party, but to me, this was one of King's strongest works in YEARS. I couldn't get it out of my head. After I read it, I flipped right back to the beginning and had to read it again--and that doesn't happen often! Anyway, I posted an in-depth spoileriffic write-up of it at my blog, if you would care to check it out. I'm interested in seeing what other fans of the story thing of my analysis.